It was built in 1889, and parts of it didn’t seem to have been replaced since then. It had been patched and smoothed over so that we did not realize what we were getting into until it began to disintegrate around us. 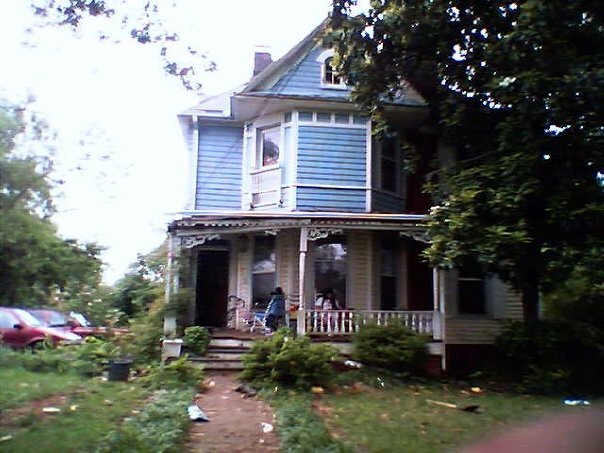 We are not handy and we could not afford the extensive renovations it needed and deserved. But we loved it, and no modern home will ever have that much personality. To go along with our old house, we had lots of old furniture. John’s first apartment was furnished with his grandmother’s old living room furniture and his grandfather’s old bedroom furniture. We added my old bedroom furniture and then started acquiring things from my friend’s antique shop. The old furniture suited the old house. We had armoires, a secretary, a sideboard, bookcases. As older relatives died, we inherited heirlooms, an old cabinet radio, paintings, clocks. Almost everything we owned was pre-owned, and we loved it all. Well, it’s gone now. And maybe it would be out of place in a four-year-old house anyway; I don’t know. One thing’s certain: we don’t mind at all that all the lovely things we have now are only new to us, because that is what we are used to. That is comforting. My grandmother had a table that was very similar. This was the kind of kitchen table a lot of people were still eating on when I was a little girl. And someone even gave me some Melmac if I want to be even more authentic! I think that John thought the table’s placement there was temporary and that when we get the Queen Anne dining room furniture from his grandmother’s home would would be moving the oak dining set from the formal dining room into the kitchen. But he is wrong. This is not going anywhere. Some old things you treasure just because they are old. Others are special because of their history, their sentimental value, their family connections. Someday I will write a weepy post about some of the heirlooms that are no more. For now, I will just say that I feel sick at the thought that so many things no longer exist to be passed down to the next generation. This beautiful quilt was handmade for me by my friend Emily. 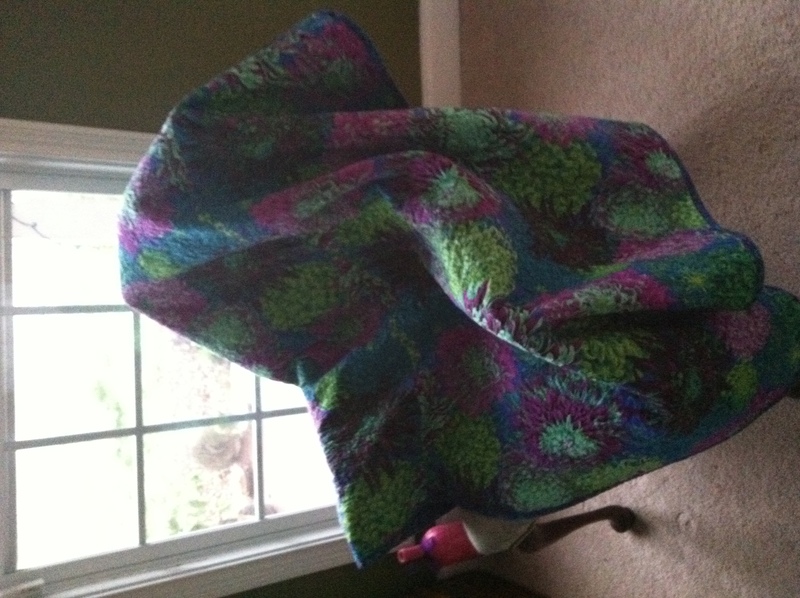 She blogs here about her various crafty projects in progress. I am amazed by her talent! Right now this beautiful heirloom-to-be is putting in its time as camouflage for the old office chairs that provide additional seating in our living room, nice side chairs being one of the few things that have not yet come our way. It is also being used by John to keep him warm when he naps on the living room couch. 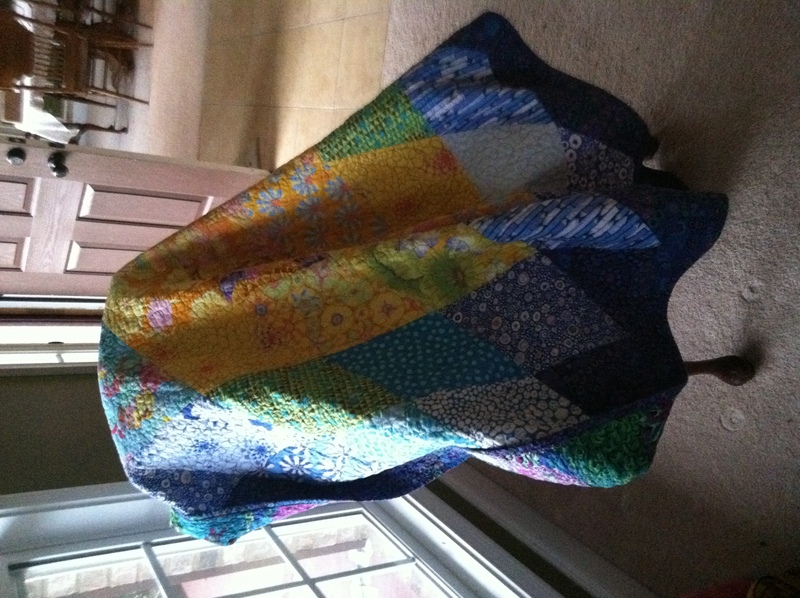 I LOVE that kitchen table – and so so glad you all like the quilt! I hope it lasts for years to come!